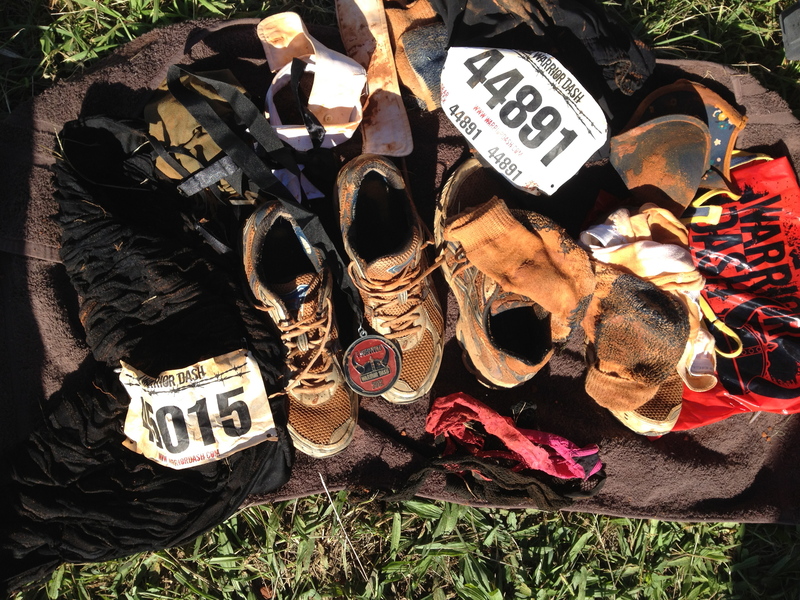 Warrior Dash 2012 – Happy. Healthy. Heathen. Because it’s fun, that’s why. The pictures at this site are so much better than any I took, and there’s video too, so take a glance at that to get an idea of what this race is like. TL; DR: 5k with obstacles. I did this race last year for the first time, and just loved it. It’s right up my alley – all fun and mud and games and mud and beer and mud. Costumes are a big part of it too, so this year we spent all of 9 minutes pulling ours together. I wish I’d taken a better picture of the fishnet stockings with the running shoes. And ours weren’t even the best costumes there. I didn’t take my phone onto the grounds because that’s the Mud Zone. The site has some good shots; the best we saw were a Pebbles and BamBam couple, complete with clubs and hairbones. We saw a team of Oompa-loompas, lots of tutus and vikings, and tutus on vikings. The race started with a series of hills/ditches with mud that were easy, but the mucky mud at the bottom was a real shoe-eater. Next came a commando crawl under barbed wire, but it was hands-and-knees height, so that just created muddy hands and knees. Next, we had an over-under obstacle which wasn’t too bad – the “over” was a wall about 4 feet high, the under was barbed wire around 2 feet high. I got a dress strap caught on one, but Eliott untangled me and off we went. Then there was a series of webbing, kind of like boxing ring ropes (that’s a guess – I don’t believe I’ve even felt the strappy things around a boxing ring). I’m sure these are out of sequence now, but somewhere along the way there was a field of tires, and junker cars laid end to end so it was hood/roof/trunk/hood/roof/trunk. The trickiest one for me this year was the rope climb – kind of an A-shape that rose about 25 feet in the air. One side was a ladder-type slant that you climbed down; the upside was a sandpaper-covered slope that you climbed by holding on to a rope. The trick was not the climb up, nor the climb down, but the transition over the top. I flattened out too soon, with my center of gravity on the rope side, and with no leverage for my legs, I was left with just powering over with upper body, like when you push up on the side of the pool to get out. As you near the finish line, there were two jumps through fire (not kidding), then the final mud pit. Mark Twain described the Mississippi River as: “Too thick to drink, too thin to plow”. Capt Clark (of Lewis and Clark) said: The water we Drink, of the Common water of the missourie at this time, contains half a Comn Wine Glass of ooze or mud to every pint. Yeah, that’s about what it was like. Even a visit to the fireman’s hose after the race was over only took off the thick top layer. It took 2 showers after that for the water to run clear. The race organizers have cleverly designed the timing-chip-for-a-beer trade, and of course turkey legs and pork sandwiches were aplenty. This race is pricey, plus a hefty $20 parking fee, but if you know that ahead of time, you can limit that by carpooling, and registering on time saves a bit too. Wave starts are every 30 minutes all day long. See you at Dash 2013! You two are nuts! Happy nuts, but nuts just the same.